First Things First on Reading Food Labels - What is a nutritional food label and who decides what’s on it? Many countries have laws about the nutritional information consumers are entitled to see when buying packaged food. This is most often delivered by way of mandatory nutrition labels. In the US, the Federal Food, Drug and Cosmetic Act (FDC Act) covers food and nutrition labeling for products sold in the US along with Nutrition Facts labels. The FDC Act is administered by the Food and Drug and Administration. In Canada, the Canadian Food Inspection Agency and Health Canada administer food labeling through the Food and Drugs Act. In the UK, several acts and levels of government apply including the European Union Food Laws and the regulations of the UK Food Standards Agency. Here we will discuss the US situation including both reading food labels and understanding food labels. There are many similarities between the various countries’ rules. While the FDA implements many food labeling regulations, the primary one concerning nutrition is the Nutrition Facts label attached to packaged food. Being able to read and understand food labels, including the Nutrition Facts, can go a long way towards enabling you to make better nutritional choices in what you buy and eat. The nutrition facts label identifies the types and amounts of key nutrients along with calories and the number and size of servings in a food. allow consumers to compare easily and quickly one food with another. 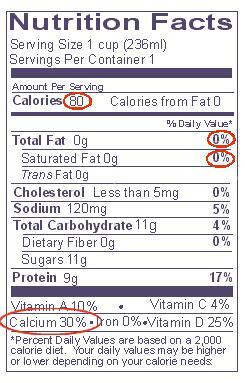 Total Carbohydrates in a serving are listed in the Nutrition Facts section of the Food Label too. Carbohydrates are further broken down between dietary fiber, as mentioned above, as well as sugars. Protein is also listed by both weight and with a % daily value, although few Americans are deficient in protein like they are in the above listed nutrients. Currently, a manufacturer is not required to identify on the Nutrition Facts Label whether the sugar occurs naturally in the food or has been added in the manufacturing process. To figure this out the consumer would have to read the ingredients list and try to figure out which sugars have are added. High Fructose Corn syrup, corn syrup, fruit juice concentrate, maltose, dextrose, sucrose, honey, maple sugar are examples of added sugars. Implicit in the idea of the Nutrition Facts, is that with enough of the right information, consumers will make healthier choices about what they eat and how much they eat of certain foods. Health Claims that food manufacturers may or may not make about a food, either on its packaging or in advertising. Allergens in food that susceptible people may want to avoid. Listing of specific ingredients so consumers can estimate proportions of an ingredient in a food. People interested in controlling their calories as part of a weight loss or weight management program and people suffering or at risk for specific health conditions affected by nutrition should read food labels and pay close attention to Nutrition Facts. Those at risk for or suffering heart disease would want to know how much saturated and trans fats as well as cholesterol are in a food, in order to reduce the amount they eat to prevent or not worsen arthrosclerosis. Those at risk for or suffering from Type 2 diabetes would be wise to know a food’s dietary fiber and sugar content in order to help control blood sugar levels. Those at risk for or suffering from Hypertension or Cardiovascular Disease would be advised to know, among other things, the sodium content of a food. Those trying to improve immune function would be interested in the amount of Vitamin C and Vitamin A a food contains, because both vitamins function as powerful anti-oxidants and immune boosters. Those at risk for or suffering from osteoporosis or ostopenia would be interested in consuming foods that contain sufficient calcium. The above is a smattering of health conditions where reading food labels and specifically the Nutrition Facts could be useful in managing or preventing the condition. You might be surprised that you’ve downed three servings and want to make appropriate calculations. The Nutrition Facts label lists the number of calories per serving. Keep in mind when reading food labels that a serving of 40 calories or less is considered low cal; 100 calories moderate; and 400 calories or more high calories. The US Government has established for certain nutrients (but by no measure all) recommended daily amounts as part of a balanced healthy diet. On the Nutrition Facts label this information is provided for fats (including total, trans and saturated), cholesterol, sodium and carbohydrates (including fiber and sugar) as a weight in grams per serving as well as a % figure for that nutrient based on a 2,000 calorie per day diet. Simply put, this means when an 18 % daily value is listed under fat for a food serving and you eat that serving, you will have consumed 18% of the total recommended daily fat intake for a 2,000 calorie per day diet. 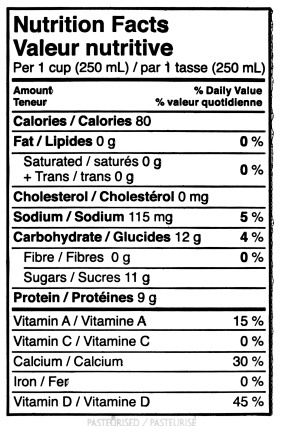 As a general rule when reading food labels, Daily Values of 5% or less are considered low for a nutrient. Daily Values of 20% or more are considered high. As mentioned, the Nutrition Facts Labels provide information based on a 2,000 per day calorie diet. A person’s daily requirements for calories may be higher or lower than 2,000 calories, depending on age, gender, height, weight and other factors, least of which are specific health conditions. See the Calories in Food page to figure out how many calories you might need per day, depending on various factors. If you consume more or less than 2,000 calories per day, your % Daily Value requirement for a nutrient in a particular serving of food will be slightly different than that listed on the nutrition facts label and you’ll have to make adjustments. Foot Note on Nutrition Facts Footnotes If the label is big enough, you may see a foot note on the Nutrition Facts label listing recommended total daily intakes for certain nutrients. These include total daily intakes for fat, saturated fat, cholesterol, sodium, total carbohydrate and dietary fiber. The label gives figures for both a 2,000 calorie per day diet and a 2,500 calorie diet. When reading food labels, you can use these figures to compare how much of a certain nutrient a particular food serving contains compared to the recommended daily intakes for that nutrient. The foot note lists the upper consumption limits, recommended by the government health authorities, for fats, cholesterol and sodium. Figures for carbs and dietary fiber are listed as recommended lower limits. Like calorie needs, recommended Daily Values are not tailored to individual requirement but are public health experts’ recommendations based on estimated average requirements for average individuals in a population. They are valuable figures and a basis from which to consider your own nutritional needs. Some Individuals and groups may require more or less of a nutrient than the recommended Daily Value suggest. Your gender and age may affect your daily nutrient requirements - For example, calcium needs are estimated for the Daily Value as 1,000 mg per day. However, according to public health authorities adolescent girls and post-menopausal women may require respectively 1,300 mg and 1,200 mg of calcium per day. It follows that an adolescent girl or postmenopausal women should aim to consume respectively 130% and 120% of the Daily Value for Calcium. You don’t find this information on the Nutrition Facts labels. Your health status may affect your daily nutrient requirements – For example, your health care provider may recommend you follow a reduced sodium diet to manage your hypertension or other health conditions you suffer from or are at risk for. In this example, your daily values for sodium might, therefore, be lower than the Daily Values listed on the Nutritition Facts. You don’t find this information on the Nutrition Facts labels. Not all experts may agree with the Daily Values recommendations - Some researchers believe that the Daily Values for certain nutrients should be higher or lower than they are. For example, some experts believe dietary fiber recommendations are too low and should be increased, if we are to prevent the many digestive related illnesses Americans suffer. In contrast, some experts believe saturated fat intake, especially from animal sources, should be less than the Daily Values currently recommended. If you have a specific health condition, it is best to talk with your health professional to figure out, if you should be modifying your diet above or below the government’s recommended Daily Values. 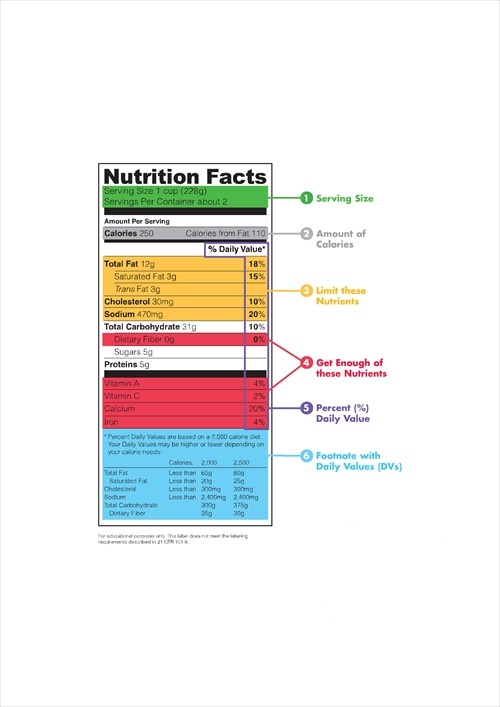 Regardless of individual health and nutrition needs, the Nutrition Facts labels provide important information about amounts and proportions of nutrients in a food that help you figure out what and how much of a food you should eat. Since 2003, the FDA has required that Trans Fatty Acids be listed on Nutrition Facts Labels because of their established effect in raising Low Density Lipoprotein LDL cholesterol (“bad cholesterol”) in the blood with its negative effect on coronary heart disease. There is also ongoing research suggesting that Trans Fats may play a role in Alzheimer's and other dementia, although the scientific jury is not in on this. 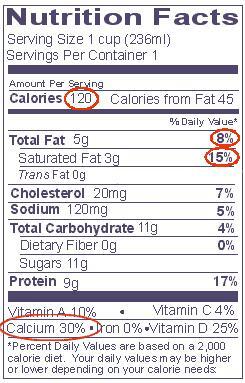 You’ll see that there is no recommended daily value listed for Trans Fats in the Nutrition Facts label. By contrast, government experts suggest you eliminate Trans Fats as much as possible from your diet. What nutrients are not required to be included in the Nutrition Facts Label but can be mentioned by foot note. If a nutrient that is required to be on the Nutrition Facts label is presented at “zero” level in a food, the following statement on the label can be used. “Not a significant source of_______”. With respect to Cholesterol, this may be less than 2 mg per serving. This is why there may be some trans fats or other unhealthy nutrients in a food that may appear, on first blush, to contain 0 grams of such nutrients. By reading the small print on the Nutrition Facts label, you can learn there may be minor amounts of these nutrients. Many additional healthful nutrients and their Daily Values are not required to be listed. Currently, Vitamin C, Vitamin A, Iron and Calcium are requiredon Nutrition Facts labels. Obviously, space is a consideration. However, there is an argument that as much information as possible about the nutrient contents of food should be provided to the consumer. This is especially the case, as more information about the benefits of certain nutrients comes forward. In addition Vitamins A, C and calcium and iron that are required to be listed, Americans are commonly found deficient in magnesium, folic acid, zinc and other essential nutrients. Query whether they and others should be listed routinely as well. As mentioned above, the advantage of standardized Nutrition Fact labels is that, when reading food labels, you can compare one similar food with another easily and quickly. Below is an example of two milk labels contained on the FDA site that show the advantage of being able to compare standardized food labels – One label is for skim milk; the other for whole milk. A quick comparison lets you see that, for the same size serving of milk (one cup-236 ml), the skim milk contains 80 calories and the whole milk 120. You see that the differences between the two foods’ nutrient content are in the fat and cholesterol content. The skim milk contains zero grams of fat and cholesterol, making the skim the preferred choice, especially if counting calories or watching saturated fat and cholesterol intake are on the agenda. The other nutrients are the same. If you want additional in-depth information on reading food labels and Nutrition Facts check out this 28 minute video produced for the FDA on making sense of food labels and the Nutrition Facts in particular. Click, here, if you want to read more from the FDA about reading food labels and Nutrition Facts. Click here, if you want more information about A Healthy Balanced Diet in general. Check out this page for more information about Calories in Food. 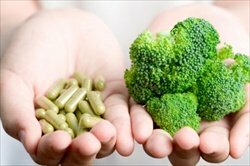 Click here to read about the Benefits of Supplements and whether you need them. Click here to readd about Digestive Enzymes. Click here to read about Omega 3s and healthy fats. Click here to read about the Benefits of Vitamin C.
Click here to read about the Benefits of Vitamin D.
Click here to read about Magnesium and Magnesium Foods. Click here to read about Calcium. Click here to read about Chromium. Click here to read about Zinc and Zinc Foods. Click to read about the benefits of organic food. Click to read about a cancer prevention diet. Click to read about a cancer and nutrition. Click to read about a cancer fighting diet. Click here to read about Anti-inflammatory Supplements and Anti-inflammatory Diets along with a list of Inflammatory Foods. To read more about maintaining even blood sugar, click on Low Glycemic Diets. For up-to-date news and commentary on diet and health, click on Healthy Diet News Blog. To return to Healthy-Diet-Healthy-You Home.